The “Interpretation of the Meanings of the Noble Qur’an in the English Language” (aka the Hilali-Khan translation) is an ultra conservative version of the Koran made more so by interpolations and footnotes derived from the commentaries of mediaeval scholars Al-Tabari, Al-Qurtubi and Ibn Kathir. First published in 1993, it has been subsidised and widely promoted by the Saudi government. Now it is reportedly the most widely disseminated Koran in the English-speaking world via Islamic bookstores and Sunni mosques. “…more like a supremacist Muslim, anti-Semitic, anti-Christian polemic than a rendition of the Islamic scripture” Khaleel Mohammed. “Perhaps the most extremist translation ever made of the Qur’an.” Robert Crane. “This current crisis (and many others), I believe is a direct result of such translations as the Hilali-Khan which have been responsible for influencing some Muslims with extremist interpretations (and also providing them “justification” for criminal actions), and for providing Islamophobes with “proof” of the supposed “savagery” of Islam. Basically, this translation (and others like it) are propaganda coming out of Saudi Arabia which attempts to spread their particular supremacist, divisive, bigoted, and very dangerous interpretation of Islam.” Sheila Musaji. What does it say on various contentious issues? This understanding is widely assumed in the Muslim world but the Hilali-Kahn translation is the only one which makes it explicit. You [true believers in Islamic Monotheism, and real followers of Prophet Muhammad SAW and his Sunnah (legal ways, etc.)] are the best of peoples ever raised up for mankind; you enjoin Al-Ma’ruf (i.e. Islamic Monotheism and all that Islam has ordained) and forbid Al-Munkar (polytheism, disbelief and all that Islam has forbidden), and you believe in Allah. And had the people of the Scripture (Jews and Christians) believed, it would have been better for them; among them are some who have faith, but most of them are Al-Fasiqun (disobedient to Allah – and rebellious against Allah’s Command). Al-Jihad (holy fighting) in Allah’s Cause (with full force of numbers and weaponry) is given the utmost importance in Islam and is one of its pillars (on which it stands). By Jihad Islam is established. Allah’s Word is made superior, (His Word being La ilaha illaliah which means none has the right to be worshipped but Allah), and His Religion (Islam) is propagated. By abandoning Jihad (may Allah protect us from that) Islam is destroyed and the Muslims fall into an inferior position; their honour is lost, their lands are stolen, their rule and authority vanish. Jihad is an obligatory duty in Islam on every Muslim, and he who tries to escape from this duty, or does not in his innermost heart wish to fulfil this duty, dies with one of the qualities of a hypocrite. And those who disbelieve are allies to one another, (and) if you (Muslims of the whole world collectively) do not do so (i.e. become allies, as one united block with one Khalifah – chief Muslim ruler for the whole Muslim world to make victorious Allah’s Religion of Islamic Monotheism), there will be Fitnah (wars, battles, polytheism, etc.) and oppression on earth, and a great mischief and corruption (appearance of polytheism). Are these fair interpretations or are they distortions of the Koran? Not being Islamic scholars, we cannot say for sure but let us take one relatively accessible example. Does the interpolation in 8:39 [in the whole of the world] do any more than make explicit what was always implicit? Surely the more important point is that these are the interpretations imbibed by so many Sunni Muslims, courtesy of the Saudi government. Why did the Saudis promote them so assiduously and what are the implications for themselves? The reason these interpretations present a problem for the Saudis lies in the long established fault line between religion and the state in the Kingdom. To understand this we need to take a brief look at the history of the House of Saud [for the full story see the comprehensive account by Alastair Crooke]. In 1741 a wandering cleric was given protection by a tribal leader in central Arabia. The cleric was Muhammad Ibn Abd al-Wahhab, a fiercely intolerant and puritanical follower of the 14th century scholar Ibn Taymiyyah. Both looked back to the Medina of Mohammed and the example the first three generations of Muslims, the Salaf, as the ideal for Muslim society. Al-Wahhab demanded that all Muslims must pledge their allegiance to a single Muslim leader, the Caliph. Those not complying should be killed, their wives and daughters violated, and their possessions confiscated. The list of those meriting death included, along with infidels, Shiites, Sufis and other Muslim denominations, who al-Wahhab did not consider to be Muslim at all. The tribal leader was Ibn Saud who saw in al-Wahhab’s teachings a religious ideology which validated his normal practice of tribal raiding as jihad, and a partnership was formed which has survived on and off to the present day. What became known as the first Saudi state grew throughout the 18th century to control most of Arabia but in 1818 it was crushed by the Ottoman empire.The followers of al-Wahhab were quiescent throughout the 19th century but rose to prominence once more in the chaos of the First World War and its aftermath. The Saudi leader Abd-al Aziz (also known as Ibn Saud) created the Saudi Ikhwan (not to be confused with the Muslim Brotherhood Ikhwan), a fighting force of Wahhabi zealots, which enabled Aziz to capture Mecca, Medina and Jeddah by 1926. In 1927 Aziz signed the Treaty of Jeddah by which Britain recognised his authority as King of Nejd (central Arabia) and Hejaz (Western Arabia). By 1928 Aziz’s forces had overrun most of the rest of Arabia, leaving only areas which also had treaties with Britain. Aziz forbade further raiding which angered the Ikhwan who regarded all non-Wahhabis as infidels who had to be converted by force. The Ikwhan revolted, leading to a civil war which lasted for two years. Aziz eventually crushed them and in 1932 united his dominions into the Kingdom of Saudi Arabia. Wahhabism was forcefully changed from a movement of revolutionary jihad to a conservative religious authority tasked with upholding the legitimacy of the Saudi regime. An uneasy division of power between Palace and Mosque remained in place as the oil wealth started to flow into the Kingdom accompanied by the inevitable westernisation. In 1975 King Faisal was shot dead by his nephew, angered by the encroachment of western beliefs and innovation into Wahhabist society. More serious was the seizure in 1979 of the Grand Mosque in Mecca by a revived Ikhwan under Juhayman al-Otaybi. Among other doctrines they believed that it was necessary for “the Muslims to overthrow their present corrupt rulers who are forced upon them and lack Islamic attributes since the Quran recognizes no king or dynasty”. After three weeks al-Otaybi and his forces were flushed out and subsequently beheaded. 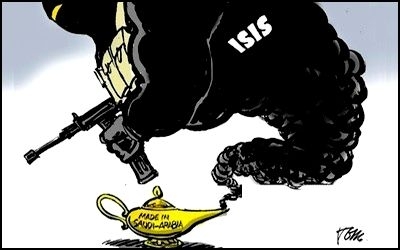 The Saudis’ response was to channel the volatile Ikhwani current away from home by exporting its brand of Islam. Since the seventies the Saudis have spent $100 billion promoting Wahhabism around the world through mosques, Imams, Islamic centres, schools, literature, scholarships, academics, journalists and prison conversion programmes. But of course what was needed above all was a distinctive scripture. That is why in 1993 the previously favoured Yusuf Ali translation was replaced by the Hilali-Khan one, a truly Wahhabi Koran. Until now (written 2015) the Saudis have been able to suppress Wahhabist zealotry within their own borders while encouraging it abroad. Now they find themselves facing an army not far from their borders which does not recognise any temporal power other than the mosque and which actively disseminates the writings of their ideological predecessor Juhayman al-Otaybi. The Islamic State, like the Ikhwan, is Wahhabism without the concession to temporal power granted to the House of Saud. Furthermore IS declares itself the restored Caliphate, an institution encouraged as we have seen in Hilali-Khan 8:73. Already IS is controlling territory the size of Britain, is self-financing through captured oil wells, is capable of attracting thousands of jihadis from around the Muslim world and has managed to drag the West into a war, confirming its position as the champion of Islam. If IS manages to grow to a position where it can directly confront Saudi Arabia which way will the Ikwhani tendency within the Kingdom jump? It must make King Abdullah and his regime very nervous. For those of us who do not wish the House of Saud well, it must be gratifying to see the monster they created now coming back to threaten them. That of course will be scant recompense for the worldwide economic disruption which would ensue if the Arabian oilfields came under IS control or were rendered inoperative. Nevertheless in these interesting times we must take our compensations where we may. This entry was posted in Uncategorized and tagged Abd-al Aziz, al-Wahhab, Hilali-Khan, House of Saud, ibn Saud, Islamic State, Juhayman al-Otaybi, King Abdullah, King Faisal, Saudi Ikhwan, Wahhabism on September 28, 2014 by ECAW's blog. It helps that under-education is the result of Leftie educational doctrine – under-educated and hyper-religious = marriage made in hell.